I love this saying..IT'S TRUTH. If we were to look around and see how we've been down sliding in health since the pioneers. 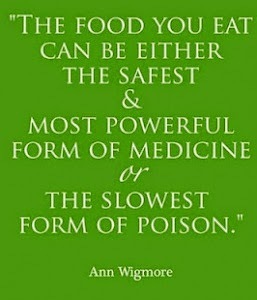 We would realize that processed food is crap!! I am not saying you can never enjoy a doughnut, hamburger, or fires. I am saying you can not do it all the time and expect for your body to run at it's best. God gave us the earth, which allows us to grow more then chemicals. Use the whole food sources such as fruits, veggies, healthy fats, and lean meat. Avoid the sugar crash, the unhappiness, the health care problems, and so much more. My next challenge group starts Oct. 20th. I have a few spots left if you feel up to learning more about fueling your body with the good stuff. Send me a message!